In accordance with section 120 of the Coroners and Justice Act 2009, the Sentencing Council issues this definitive guideline. It applies to all offenders aged 18 and older, who are sentenced on or after the effective date of this guideline, regardless of the date of the offence (subject to requirement(s) being applicable). This guideline applies only to offenders aged 18 and older. General principles to be considered in the sentencing of children and young people are in the Sentencing Guidelines Council’s definitive guideline, Overarching Principles – Sentencing Children and Young People. Community orders can fulfil all of the purposes of sentencing. In particular, they can have the effect of restricting the offender’s liberty while providing punishment in the community, rehabilitation for the offender, and/or ensuring that the offender engages in reparative activities. Sentencers must consider all available disposals at the time of sentence; even where the threshold for a community sentence has been passed, a fine or discharge may be an appropriate penalty. In particular, a Band D fine may be an appropriate alternative to a community order. Sentences should not necessarily escalate from one community order range to the next on each sentencing occasion. The decision as to the appropriate range of community order should be based upon the seriousness of the new offence(s) (which will take into account any previous convictions). Save in exceptional circumstances at least one requirement must be imposed for the purpose of punishment and/or a fine imposed in addition to the community order.5 It is a matter for the court to decide which requirements amount to a punishment in each case. The seriousness of the offence should be the initial factor in determining which requirements to include in a community order. Offence-specific guidelines refer to three sentencing levels within the community order band based on offence seriousness (low, medium and high). 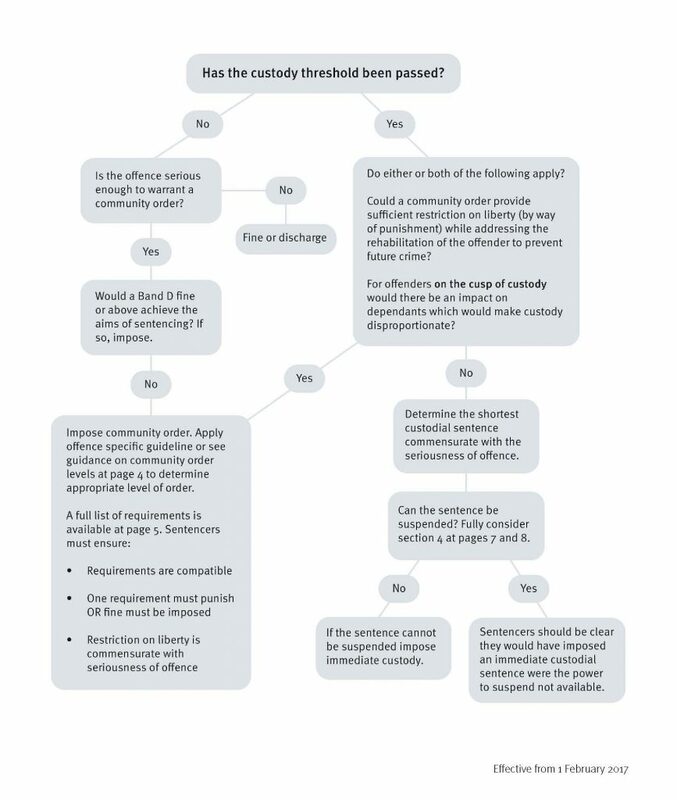 The culpability and harm present in the offence(s) should be considered to identify which of the three sentencing levels within the community order band (low, medium and high) is appropriate. See below for non-exhaustive examples of requirements that might be appropriate in each. A full list of requirements, including those aimed at offender rehabilitation, is given below. Where two or more requirements are included, they must be compatible with one another and must not be excessive. Any requirement must not conflict with an offender’s religious beliefs or with the requirements of any other order to which they may be subject. Interference with an offender’s attendance at work or educational establishment should also be avoided. the availability of the requirements in the local area. rehabilitation activity requirement (RAR’s provide flexibility for responsible officers in managing an offender’s rehabilitation post sentence. The court does not prescribe the activities to be included but will specify the maximum number of activity days the offender must complete. The responsible officer will decide the activities to be undertaken. Where appropriate this requirement should be made in addition to, and not in place of, other requirements. Sentencers should ensure the activity length of a RAR is suitable and proportionate). mental health treatment requirement (may be residential/non-residential; must be by/under the direction of a registered medical practitioner or chartered psychologist. The court must be satisfied: (a) that the mental condition of the offender is such as requires and may be susceptible to treatment but is not such as to warrant the making of a hospital or guardianship order; (b) that arrangements for treatment have been made; (c) that the offender has expressed willingness to comply). attendance centre requirement (12 – 36 hours. Only available for offenders under 25). In many cases, a pre-sentence report will be pivotal in helping the court decide whether to impose a community order and, if so, whether particular requirements or combinations of requirements are suitable for an individual offender. Whenever the court reaches the provisional view that a community order may be appropriate, it should request a pre-sentence report (whether written or verbal) unless the court is of the opinion that a report is unnecessary in all the circumstances of the case. It may be helpful to indicate to the National Probation Service the court’s preliminary opinion as to which of the three sentencing ranges is relevant and the purpose(s) of sentencing that the package of requirements is expected to fulfil. Ideally a pre-sentence report should be completed on the same day to avoid adjourning the case. If an adjournment cannot be avoided, the information should be provided to the National Probation Service in written form and a copy retained on the court file for the benefit of the sentencing court. However, the court must make clear to the offender that all sentencing options remain open including, in appropriate cases, committal for sentence to the Crown Court. The court may impose electronic monitoring in all other cases. Electronic monitoring should be used with the primary purpose of promoting and monitoring compliance with other requirements, in circumstances where the punishment of the offender and/or the need to safeguard the public and prevent re-offending are the most important concerns. The approach to the imposition of a custodial sentence should be as follows. Has the custody threshold been passed? A custodial sentence must not be imposed unless the offence or the combination of the offence and one or more offences associated with it was so serious that neither a fine alone nor a community sentence can be justified for the offence. There is no general definition of where the custody threshold lies. The circumstances of the individual offence and the factors assessed by offence-specific guidelines will determine whether an offence is so serious that neither a fine alone nor a community sentence can be justified. Where no offence specific guideline is available to determine seriousness, the harm caused by the offence, the culpability of the offender and any previous convictions will be relevant to the assessment. The clear intention of the threshold test is to reserve prison as a punishment for the most serious offences. Is it unavoidable that a sentence of imprisonment be imposed? Passing the custody threshold does not mean that a custodial sentence should be deemed inevitable. Custody should not be imposed where a community order could provide sufficient restriction on an offender’s liberty (by way of punishment) while addressing the rehabilitation of the offender to prevent future crime. For offenders on the cusp of custody, imprisonment should not be imposed where there would be an impact on dependants which would make a custodial sentence disproportionate to achieving the aims of sentencing. What is the shortest term commensurate with the seriousness of the offence? In considering this the court must NOT consider any licence or post sentence supervision requirements which may subsequently be imposed upon the offender’s release. Can the sentence be suspended? A suspended sentence MUST NOT be imposed as a more severe form of community order. A suspended sentence is a custodial sentence. Sentencers should be clear that they would impose an immediate custodial sentence if the power to suspend were not available. If not, a non-custodial sentence should be imposed. The following factors should be weighed in considering whether it is possible to suspend the sentence. The imposition of a custodial sentence is both punishment and a deterrent. To ensure that the overall terms of the suspended sentence are commensurate with offence seriousness, care must be taken to ensure requirements imposed are not excessive. A court wishing to impose onerous or intensive requirements should reconsider whether a community sentence might be more appropriate. the court should obtain a pre-sentence report, whether verbal or written, unless the court considers a report to be unnecessary. Ideally a pre-sentence report should be completed on the same day to avoid adjourning the case. Magistrates: Consult your legal adviser before deciding to sentence to custody without a pre-sentence report. The guidance regarding pre-sentence reports applies if suspending custody. If the court imposes a term of imprisonment of between 14 days and 2 years (subject to magistrates’ courts sentencing powers), it may suspend the sentence for between 6 months and 2 years (the ‘operational period’). The time for which a sentence is suspended should reflect the length of the sentence; up to 12 months might normally be appropriate for a suspended sentence of up to 6 months. Where the court imposes two or more sentences to be served consecutively, the court may suspend the sentence where the aggregate of the terms is between 14 days and 2 years (subject to magistrates’ courts sentencing powers). When the court suspends a sentence, it may impose one or more requirements for the offender to undertake in the community. The requirements are identical to those available for community orders. A custodial sentence that is suspended should be for the same term that would have applied if the sentence was to be served immediately. 2 s.150A Criminal Justice Act 2003 nb: s.151(2) conferring powers in other circumstances is NOT in force.